Thanks to Magic Cabin I got to review this Baby Play Mat with Rattle Mouse! It is soft, adorable and I love the colors! What a precious baby shower gift! 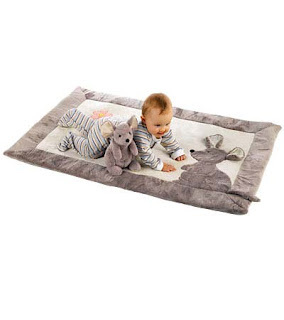 The "cream of the crop" of baby play mats, this features unbelievably soft velour fabric, super-comfy padding, two squeaky flowers, a friendly mouse with crinkly ears, and textured non-slip backing. Adding to baby's delight is a cuddly mouse toy with the same delightfully noisy ears, silky fur, and a rattle. Includes a vinyl carry bag with velour handles. one of these baby play mats here on my blog! This is so cute! I have a couple of babies in the family that I could gift this to! Count me in. This is soooo cute! Thanks for the chance to win! I'd love to give that to my three week old niece! This looks so cute my baby would love it! Please enter me to win! I love this, my little sister is preggo with her first and doesn't have anything yet, this would be a great gift!! Following you now! I love your site! Wow, I would love to win this and gi ve it to my nephew. I'm now a follower. Thanks for the chance to win. I have link this candy in my blog. so cute. I want it! I know just the baby I would love to have this for! It's really a cute one! This looks great! :) I love the cute simplicity of it! Looks so soft and cute! How adorable...I'd love for my newborn to be able to play on this! Very cute and soft looking. My grandbabies would love it! Very nice mat. Thanks for the chance to win! Have your button on left side bar. My 6 month old daughter would love this! I am loving the mouse!!! Not sure if I would keep it for the next child or give it to my new niece, hmmm?! how adorable- would love to have this! thanks for the chance! Would love to win this for the new baby...I'm due anytime soon.. This would be so adorable to give to my baby cousin. +1 This would be perfect to give to my great niece. Adorable, would like to give this to my new niece.